Business hours: shops, offices, pubs etc. EU citizens may live and work free of any immigration controls. Citizens of the USA, Canada, Australia, South Africa and New Zealand are generally allowed to stay six months without a visa. Greenwich Mean Time (GMT/UTC) or BST (British Summer Time), which is GMT/UTC +1 and lasts approximately from the end of March to the end of October. With many, many exceptions, business hours are Monday through Friday from 9am to 5pm. Opening hours for shops are almost completely deregulated, so leading to many shops being open late and sometimes even 24 hours for the local 7-11. Some restrictions still remain in relation to Sunday trading so you may find some shops having shorter opening hours. In country towns, there is usually an early closing day (often on Wed or Thurs), when the shops close at 1pm. Chemists: Every police station in the country has a list of emergency chemists. Dial “0” (zero) and ask the operator for the local police, who will give you the name of one nearest you. Licensing Laws: The legal drinking age is 18. Children under 16 aren’t allowed in pubs, except in certain rooms, and then only when accompanied by a parent or guardian. Don’t drink and drive. Penalties are severe, with disqualification automatic if you’re over the limit. Licensed Premises Opening Hours: Monday through Saturday from 11am to 11pm, and on Sunday from noon to 10:30pm. Premises with a restaurant licence can continue serving until midnight (11:30pm Sun), provided the sale of alcohol is ancillary to a table meal. Some businesses with a Supper Hours Certificate, and which provide live entertainment for diners, can apply to the licensing justices for an extended hours order, granting a further extension of drinking hours to 1am Monday through Saturday. In hotels, liquor may be served from 11am to 11pm to both residents and non-residents; after 11pm, only residents, according to the law, may be served. Mail: Post offices and sub-post offices are open Monday through Friday from 9am to 5:30pm and Saturday from 9:30am to noon. Tax Refunds: There is a 17.5% national value-added tax (VAT) included in the price of many items you buy. This can be refunded if you shop at stores that participate in the RetailExport Scheme (signs are posted in the window). The euro (€) may have replaced the national currency of 12 countries within the European Union, but they didn’t include the UK, which still uses the Pound Sterling (GBP). British money is now based on the decimal system – there are one hundred pence to each pound. Coins have the values of 1p, 2p, 5p, 10p, 20p, 50p, £1 and £2. 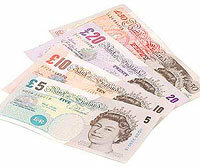 Notes have the values of £5, £10, £20 and £50. You can exchange currency at any bank branch (hours are listed below). Automatic cash machines can be found just about everywhere. Bank Opening Hours: Banking hours in England are usually from 9:30am to 4:30pm, Monday to Friday. Currency exchange: Currency exchange can be carried out at all bank branches and some Post Offices (post offices in England don’t charge commission when exchanging currency). Bureaux de change can also be found in large department stores, railway stations, airports and near to tourist sites. Please note: although the exchange rate is fixed, commission rates are not. By law these must be clearly displayed and you should keep an eye out for outrageous commissions. Emergencies: Police: Dial 999 for police, fire, or ambulance. Give your name, address, and telephone number and state the nature of the emergency. Losses, thefts, and other criminal matters should be reported to the police immediately. Local area codes all begin with “0”; you drop the “0” if you’re calling from outside Britain, but you need to dial it along with the area code if you’re calling from another city or town within Britain. For calls within the same city or town, the local number is all you need. Directory assistance in London, dial 142; for the rest of Britain, 192. There are three types of public pay phones: those taking only coins, those accepting only phone cards (called Cardphones), and those taking both phone cards and credit cards. At coin-operated phones, insert your coins before dialing. The minimum charge is 10p. Phone cards are available in four values: £2, £4, £10, and £20. You can buy pay-as-you-go SIM cards from most mobile phone retailers and many electrical stores. You use them until the total value has expired. Cards can be purchased from news stands and post offices. If your mobile phone accepts SIM cards from companies other than the one you usually use it with, you should be able to register the SIM and use it during your trip. You can also use credit call pay phones which operate on credit cards (Access (MasterCard), Visa, American Express, and Diners Club). These are usually found at airports and main railway stations. For calling reverse charges (collect) or if you need an international operator, dial 155.